El Frangipani House está situado en Toowoomba, a 2,2 km del teatro Empire y a 2,6 km del centro comercial Grand Central, y ofrece alojamiento con aire acondicionado, terraza y conexión WiFi gratuita. Casa con jardín y zona de barbacoa. La casa da a un patio con vistas al río y consta de 3 dormitorios. La casa también dispone de cocina y 2 baños. La Universidad del Sur de Queensland - Toowoomba se encuentra a 9 km de la casa. El aeropuerto de Toowoomba City Aerodrome queda a 7 km. Frangipani House recibe clientes de Booking.com desde el 5 de dic de 2018. ¿Cuándo quieres alojarte en el Frangipani House? 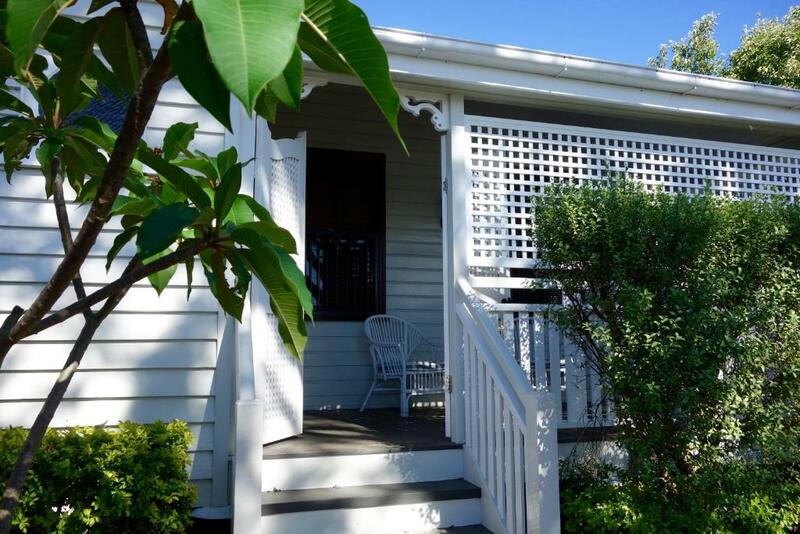 A large, 3 bedroom, 2.5 bathroom classic Queenslander, located in East Toowoomba. Two lounge spaces, study, kitchen, laundry, secure carport, fully fenced garden, log fire. Brand new furnishings and linen will make your stay super comfortable. Easy entertaining with the fully equipped kitchen, BBQ, extra long dining table and outdoor setting. Walking distance to cafes and restaurants. Five minute drive to Queen's park, Toowoomba Grammar School, CBD and St Vincent's Hospital. This large family home will easily accommodate up to 7 people. Ideal for extended or large families, business travellers, relocations, move out renovations, wedding parties, pre baby waitings. There are two Queen Size beds, a set of singe beds and a trundle bed. All beds have new mattresses and bedding and are super comfortable. There is an ensuite bathroom to one of the QS bedrooms and another separate bathroom with bath. There is a laundry with washing machine, dryer, iron and board. There is a TV with Netflix in the large lounge room with deep comfy couches to curl up on.There is an additional lounge space opposite the kitchen and dining room with a beautiful log fire. My name is Megan Neilson and I am the host of Frangipani House. Welcome! I am a Toowoomba local of 13 years with my husband and our three, now not so young, children. I have lived in many cities and country towns across Australia, the UK and Europe. However when it came time to raise our family this was the place we decided to settle. It seems to offer the best of all worlds; a city with a country town feeling, a temperate climate, low stress commuting, excellent education choices, vibrant arts scene, fabulous food, proximity to the beaches, country & capital cities. It has it all. With a love of travel and an extended family strung out across the world I have stayed in my share of amazing and not so great accommodation and everything in between. I have also been lucky enough to have enjoyed the hospitality of some of the most generous people in the places that I have stayed. With this in mind I decided to establish Toowoomba Holiday Rentals, where you can find a place to stay that is just a bit out of the ordinary. Beautiful homes in great locations filled with the comforts of home, so you can really feel at home, whilst you are here. Léeme Frangipani House acepta peticiones especiales. ¡Añádelas en el siguiente paso! Informa a Frangipani House con antelación de tu hora prevista de llegada. Para ello, puedes utilizar el apartado de peticiones especiales al hacer la reserva o ponerte en contacto directamente con el alojamiento. Los datos de contacto aparecen en la confirmación de la reserva. Necesitamos al menos 5 comentarios para calcular la puntuación. Si reservas y comentas tu estancia, ayudarás al Frangipani House a mostrar su puntuación.